Ten Speed Press, 9780399580536, 192pp. From the #1 New York Times bestselling author and star of Netflix’s Tidying Up with Marie Kondo, this graphic novelization brings Kondo's life-changing tidying method to life with the fun, quirky story of a woman who transforms her home, work, and love life using Kondo's advice and inspiration. Marie Kondo presents the fictional story of Chiaki, a young woman in Tokyo who struggles with a cluttered apartment, messy love life, and lack of direction. After receiving a complaint from her attractive next-door neighbor about the sad state of her balcony, Chiaki gets Kondo to take her on as a client. Through a series of entertaining and insightful lessons, Kondo helps Chiaki get her home--and life--in order. This insightful, illustrated case study is perfect for people looking for a fun introduction to the KonMari Method of tidying up, as well as tried-and-true fans of Marie Kondo eager for a new way to think about what sparks joy. Featuring illustrations by award-winning manga artist Yuko Uramoto, this book also makes a great read for manga and graphic novel lovers of all ages. ". . . like a cartoon character come to life to bless you with tidiness." "Sparks of joy are guaranteed. . ."
". . . charming and whimsical . . . If organizational mandates are medicine, this book is like a spoonful of sugar." "Whether you're a dedicated Kondo follower, or a KonMari Method newbie looking for some organizational tips, this cute animated book is sure to inspire your inner neat-freak." 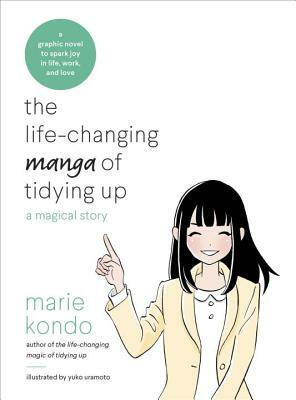 "Fans of Kondo’s runaway hit, The Life-Changing Magic of Tidying Up, will recognize tenets of her cleaning philosophy, woven through a classic manga-style read. Decluttering tips paired with a potential love story? I gobbled this up in a day." "There aren’t many comics that teach actual practical lessons, which is what makes this one so surprising. This could be one of those rare examples of a comic with real universal appeal." "Readers reluctant to submit to word-heavy lectures may be beguiled—and even con- verted—by witnessing Chiaki’s success as played out in an enjoyable story that paints Kondo as more inspiring than inquisitorial." ". . . the organization expert who dazzled the world. . ."
"Just in time to make good on your New Year’s vow to get organized." ". . .perhaps the world’s only decluttering celebrity." ". . .Marie Kondo is helping the world to properly (and lovingly) store their most beloved possessions, one fold at a time." "To show you how serious my respect for Ms. Kondo is: if I ever get a tattoo, it will say, Spark Joy!" "The most organized woman in the world." ". . . her voice . . . is by turns stern and enchanted, like a fairy godmother for socks." "Kondo's method really can change your life — if you let it." "Kondo challenges you to ask yourself whether each object you have is achieving a purpose. Is it propelling you forward or holding you in the past?" "Its strength is its simplicity."